Mickey Mouse turns 81 years old today, and he is still as spry as he was back in those Plane Crazy, Steamboat Willie days. 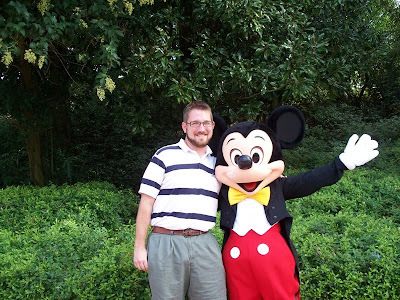 While the birthday may be contested, and the storied history of Mickey intriguing, I thought that today I would speak to Mickey Mouse the person, well, uh, mouse actually. I remember all of those posters from the 1990s that spouted All I Ever Needed to Know I Learned From (fill in the blank) and, looking back, believe an argument could be made that all I ever needed to know I learned from Mickey Mouse. Through Mickey Mouse I have seen how to overcome fears, to be brave, loyal, and show compassion to those less fortunate than I am. I have gained a sense of adventure, humor, and humility from him. And I have learned that I must stand up on my own two feet, smile in the face of the most daunting challenges, and that loving and being loved by those around us is the greatest gift of all. Sitting on my desk, right between myself and the computer monitor is a small figure of Mickey Mouse is safari gear that I picked up at Disney’s Animal Kingdom a few years back. When I am stumped for an article, feel too tired to write, or wonder why I spend all of this time responding to emails I see Mickey directly in my line of sight. In that moment I have a moment, not exactly a ‘what would Mickey do?’ moment, but more along the lines of remembering how much I love those who have gathered around me, and how much I enjoy sharing this passion, and how Mickey has always faced his challenges to the best of his abilities. Walt Disney has often been quoted for saying it was all started by a mouse, but the honest truth is that Walt gave us Mickey Mouse after years of hard work, defeats, and determination. In this way, Walt and Mickey are very much one in the same. Mickey is my pal, an inspiration, and a one swell mouse. Happy birthday Mickey! Very well said, Ryan. :) I just always remember Mickey being there since I was born, so I've grown up watching the constant antics of him and his pals. Then when I went to Walt Disney World for the first time, forget it, Disney's all ready hooked me! Happy 81st, Mickey! By the way, you do a bang up job with the blog here, and with your appearances on Lou Mongello's WDW Radio Show. It's always a treat to listen to insightful knowledge about my favorite place on Earth (WDW). Keep up the great work!